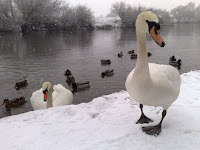 Back to where we located the second shoal of prey fish on Monday resulted in a pike first cast, and was followed by 5 more pike within the hour to 9lb 7oz before the swim dried up. Unfortunately Paul missed this action as he had spent the night up with his baby. 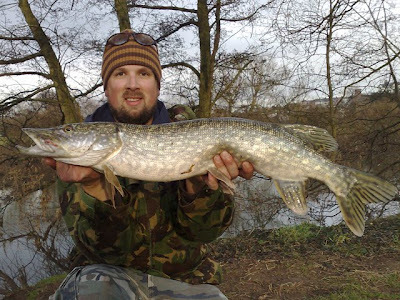 We relocated to an old favourite swim (both myself and Paul have taken 20 pounders here before) where Paul had a pike first cast, it was the 10lb 4 oz pike he caught on Monday. 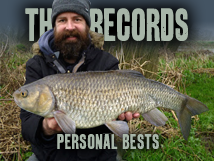 The action here was slow, with Roger taking a Jack pike on a float fished bleak and Paul pulling out all the favourite methods. We decided to try some pikey looking swims we had seen earlier, but just before we left my float went down about 6 inches and stayed there. I waited a couple of seconds to see if a run would develop, when it didn't I struck anyway. 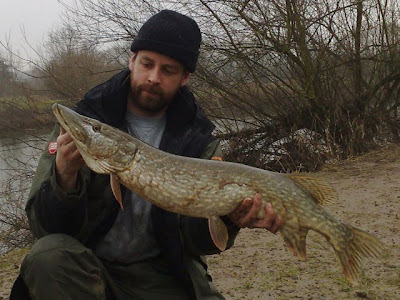 I was stuck in some weed or something, so I gently pulled it up to the surface, only to be greeted by a very large pike which spat out my bait before sinking back to the depths not to be seen again... I'll get her next time! Are you sure we are holding the correct fish? 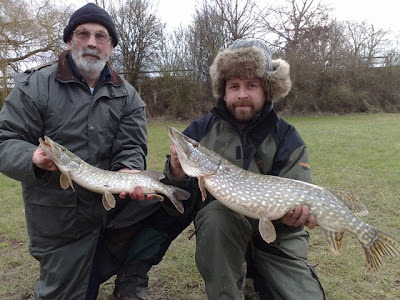 After several fruitless hours fishing in the rain, sleet and snow both myself and Roger were ready to go home, but Paul persevered resulting in 2 more pike, both just under 10lb.